This set includes two separate radio modules (with associated cables) that can both transmit and receive data over distances up to a mile. Since they communicate via UART, one can either connect a given module to a microcontroller or to a computer serial port. 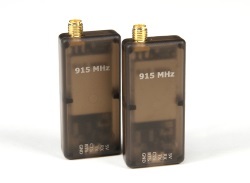 No FTDI is needed since you can directly connect the radios with a mini USB cable. Connect the radios to Teensy 2.0's as per the wiring diagram below. The resistors are used to level shift the Teensy's 5V signal in order to not damage the radios. Program the Teensy's, one with the transmitter code and one with the receiver code. Press the button connected to the transmitting Teensy to light the LED connected to the receiving Teensy.